The region has made smart investments in building the Metro system over the past four decades. It would take the region $40 billion in today’s dollars just to rebuild the same Metro capital assets, excluding rights-of-way. 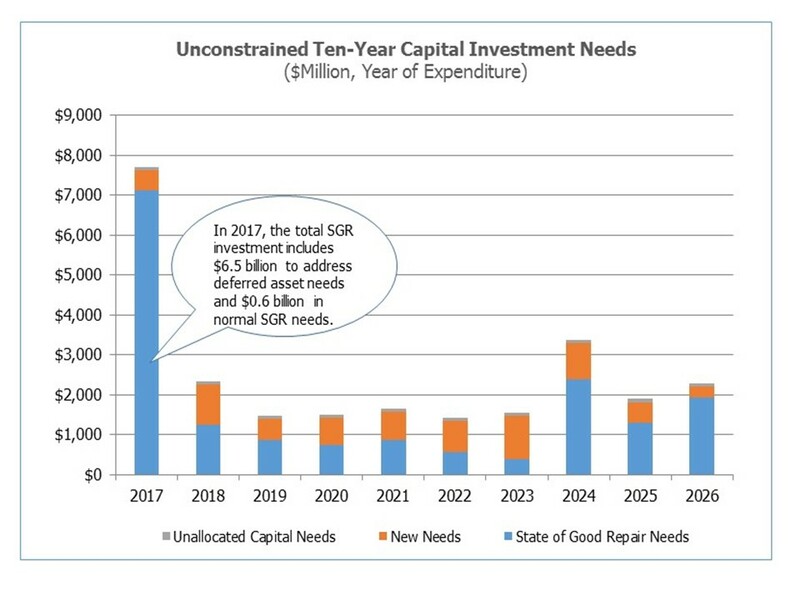 Metro needs approximately $25 billion in capital investment over the next 10 years to achieve a State of Good Repair (SGR), meet regulatory compliance, modernize technology, and address longstanding and emerging safety needs. Metro needs to invest about $17 billion on the system we have to return it to a State of Good Repair (SGR) and sustain the SGR over the next ten years. Included in this estimate is approximately $7B in rehabilitation or replacement for assets that as of 2016 have already exceeded their useful life. These deferred asset needs are spread across all major asset categories and operating modes, including Metrorail, Metrobus, MetroAccess, and business support. Finally, Metro needs to budget approximately $800 million over the ten years to cover a variety of capital activities, such as regular repairs and maintenance and engineering services. The CNI report (PDF) is online for your reading pleasure, and this will be the first in a series of posts highlight the report’s detailed findings. Stay tuned.